Are you ready for a smile transformation from your Minneapolis dental team? Complete this 2 minute quiz to discover your options! Your smile is the first thing most people notice when they meet you. It's a way to express yourself and show others that you appreciate them. You want to make sure your smile is in the hands of a team you can trust. We've created a free ebook, to help you choose the best doctor for your smile. ‘‘The Serene Oaks Dental Team is the finest team in dentistry I have ever experienced. How many people do you know look forward to go to the dentist? You will experience an awesome team and a welcoming atmosphere. Serene Oaks Dental team has the most advanced training with a wide range of knowledge you will ever encounter. Make your smile glow with life, confidence, joy, and the best of your personality! It's time to show people who you truly are! Contact Dr. Horn and Dr. Loween for incredible and durable cosmetic dentistry results done right the first time! 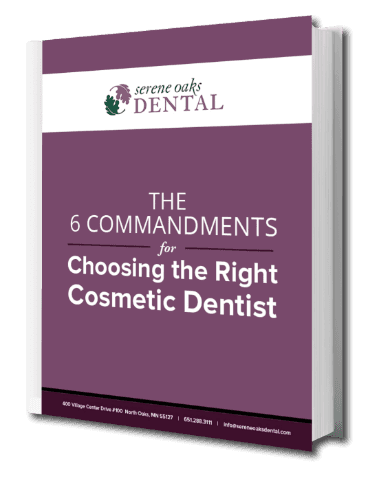 Download your Top 6 Commandments for Choosing the Right Cosmetic Dentist to make an educated decision.